With the amount of time I spend shopping at Sephora, it's crazy I have not yet tried their subscription box. YES! 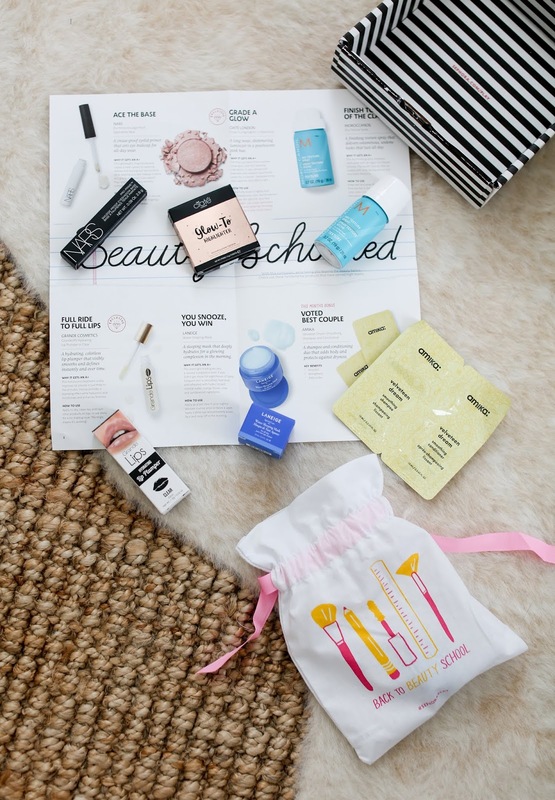 Sephora has a beauty subscription box called Play! By Sephora. *throws confetti* Especially if you are a regular shopper at Sephora, this box is a must have. It's a great way to try new products whether that be skincare, hair, or makeup and all the brands featured in every box are carried at Sephora. It's the only subscription box with 100% prestige products. You can customize your profile online so the boxes are tailored to your preferences, and then everything available in each box can be purchased in a full size at Sephora. The August box arrived this week for me and the deluxe size of my favorite NARS eye shadow primer was worth it alone. Ha! In addition to the NARS primer, my August box contained a Ciate Highlighter, Moroccanoil Dry Texture Spray (I tried this and loved it! ), Grande Lips lip plumper (it's clear so I can put over any lip color), the cult classic Laniege Water Sleeping Mask (this mask is like a shot of water for your skin) and the Amika Velveteen Shampoo and Conditioner. I also peeked at the July box contents online and this one was chock full of amazing skincare samples! It's the perfect way to test out new things and decide if you want to invest in a full size option. Or if you travel, hoard these so you have everything you need for your next trip. :) To get all details for the Play! By Sephora box, click here. Subscribe today! The post was sponsored by Play! By Sephora. All opinions are my own.